I was thrilled to receive a pre-release copy of Leigh Fleming's new book: Whatever We Are: A Highland Springs Romance. Liza Fisk is cursed. The holidays often mean disaster for her, including a car accident ten years ago that put her in a coma. She’s learned to forsake the holiday spirit due to continued calamity…but her luck is about to change. The Highland Springs city council is accepting secret bids on the abandoned “castle” her great-grandfather built and Liza is finally going to realize her dream of opening an art gallery. Until her arch nemesis rolls back into town with plans to ruin her Christmas. Again. This time, Liza is taking preemptive measures and, in a moment of insanity, announces that she and her brother’s best friend, Tucker, are playing the town’s Mr. and Mrs. Claus. Brewery-owner Tucker Callum knows he’s going to win the castle with his proposal for a proper English pub. He’s so sure, in fact, that he’s already sold his house and moved into a camper behind the brewery. But his buddy Liza is afraid he’ll freeze to death in the West Virginia winter and insists he move into her spare bedroom. She’s made it crystal clear in the past that they could never be more than friends, but now that Tucker’s living in her house and playing the role of her holiday husband, he’s secretly hoping their ruse will turn to reality. Liza slowly opens her heart to Tucker and the holiday spirit…until she learns that he is bidding against her for the castle and deliberately keeping it a secret. Will Liza be able to trust Tucker in the end or will the Christmas curse strike again? It's Christmas time in Highland Springs, West Virginia, and love is in the air...maybe. Once again, Mrs. Fleming has taken peripheral characters from a previous book, and told their story. This is the third installment in Leigh's Whatever series, but the story definitely stands on its own. You've read the description, so I won't repeat it, but I loved this book. The story is well told and engrossing. The setting is vividly described. The characters are real and relatable--I love that Mrs. Fleming's protagonists are likable, but flawed. It's a quick, easy, hard-to-put-down, uplifting read, perfect to read on vacation, or when you *need* a quick vacation from reality. For a limited time, the Kindle version is on sale for $1.99. Also check out the first and second books in this series, Whatever You Call Me, and Whatever You Say (read my review). This week, we're having an eat-the-random-things-in-the-freezer week. Not because we necessarily need the space, but the other day I found some things I had forgotten about, and I will surely forget about them again if I don't get them on the menu. This week, I'm also doing some prep work ahead of time for when we have guests near the end of next month. I'll be cooking some chicken and browning sausage and ground beef, and then storing it in the freezer, to make putting casseroles and soups together fast and easy. I am so on board for fast and easy. So I guess we do need room in our freezer. Anyway, here's what's on the menu for this week. As I was driving home from a mystery shopping assignment last Friday, the irony struck me, for the first time. I really dislike shopping. One might even go so far as to say I hate shopping. I have never understood recreational shopping. And yet, here I am, shopping professionally. When I thought about it further, though, I realized that it is rare for me to actually go to a store for a mystery shop. My very favorite mystery shop does not involve actual shopping, and the mystery shop I do most often is online, with no actual shopping, so I don't have to go anywhere or even get dressed. Maybe it's not so strange, after all. On Monday I had a whole lot of errands to run. I listed them, and counted ten different stops that I needed to make, eight of which were at stores. You know, stores, where shopping occurs. Ugh. First of all, I stay home on Mondays, so that was one whole big heap of wrong right there. But ten stops! In one day! For a shopping-hater. And that's when I realized that it's not shopping that I hate, not really. It's spending money that I'm averse to. That's why the eight shopping stops. I probably could have taken care of everything on my list with one stop; for sure two stops would have sufficed. But I had a free gift card for this store, and that store had an awesome rebate on batteries, and the other store has Cartwheel, and I had to return the thing that I bought at that other store because it had the best price. And everything's a dollar (Even though most of it's crap)! And while those stores have food, they don't really have groceries. I hate spending more money than I have to, which is why, all these years, I've thought that I hate shopping. Huh. And because I hate spending more money than I have to, I go to a lot of different stores to make lots of little purchases. While it's always gratifying to learn something about oneself, I'm not sure what to do with this one. It's kind of a problem for the household's procurement officer to not want to spend money. I still don't understand recreational shopping. 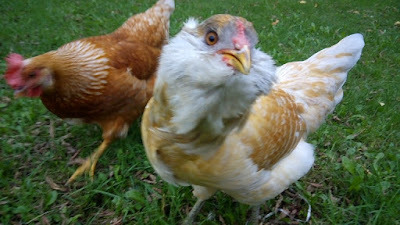 Yes, Toasty Crunch and Rocky are still laying about a dozen eggs a week collectively. 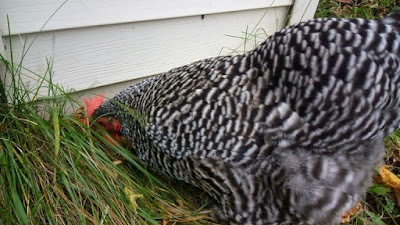 No, Esther isn't laying yet (although Bubby thinks she might have done a halfhearted submissive squat the other day). Yes, I am still buying eggs at the grocery store (but it's definitely fewer than before). In other news, I thought that the shredded paper bedding wasn't working for the deep litter method, so I cleaned it out and put pine shavings in the hen house. I guess what this means is that easy wins out over inexpensive. Good to know. But while I was cleaning out the paper, I realized it had composted more than I had thought. I still think cross-cut shredded paper would work better, but perhaps my strips are adequate. The strips of paper are just so fluffy, which in a chicken is a desirable trait, but in chicken bedding, not so much--the fluffy makes it difficult to cover and turn. In any case, I'm committed to using pine shavings for the next 5.7 cubic feet, at least. Maybe I'll switch back, or maybe not. Rocky, preparing to lay. 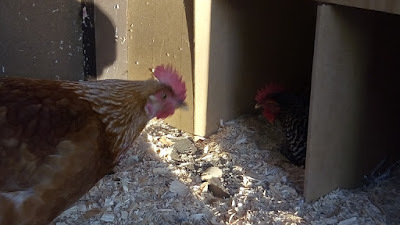 It was surprising to me how long the girls hang out in the nest box before the egg arrives. I kind of thought they went in, laid an egg, and came out. Nope. We're not sure of the exact timing, but we do know it's at least an hour. 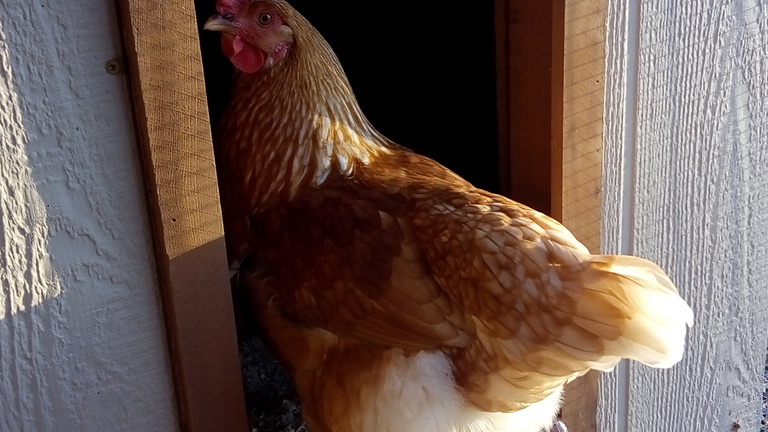 Chickens like to lay their eggs all in the same nest box, so there is sometimes competition for the favorite. Lately, Esther's been perching on my boot or arm. It warms my heart. 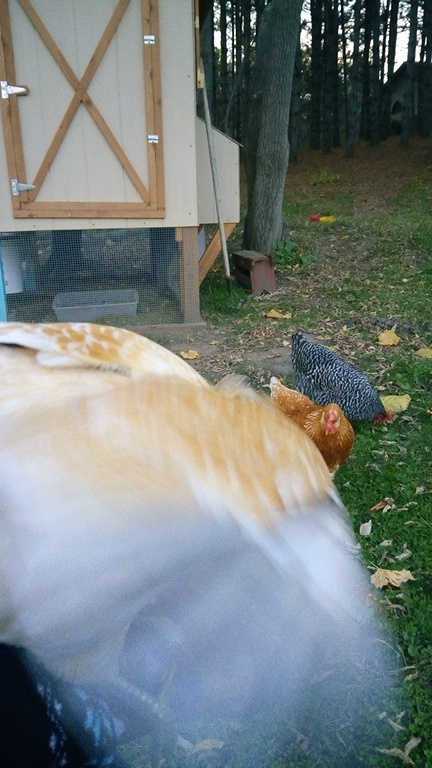 I'm trying to get a video of Esther flying for y'all. It's pretty impressive. Being a grown-up kinda stinks sometimes. After a rough night of little sleep, I really didn't want to get out of bed this morning. Unfortunately, as the grown-up, it's up to me to get the little person up and out the door in the morning. And yes, I could get him up, ready, and out, and then go back to bed, but another part of being a grown-up that stinks is it doesn't work to go back to bed. Humph. It's on days like this that I wish I liked coffee. It's sunny, but cold and blustery today, and this morning, when I needed to get out of bed, it was dark, cold, and windy. What a lovely thing it would be to wrap hands around a hot cup of coffee, and breathe in warm coffee-steam to ease the transition from my warm bed to the cold, cruel world. 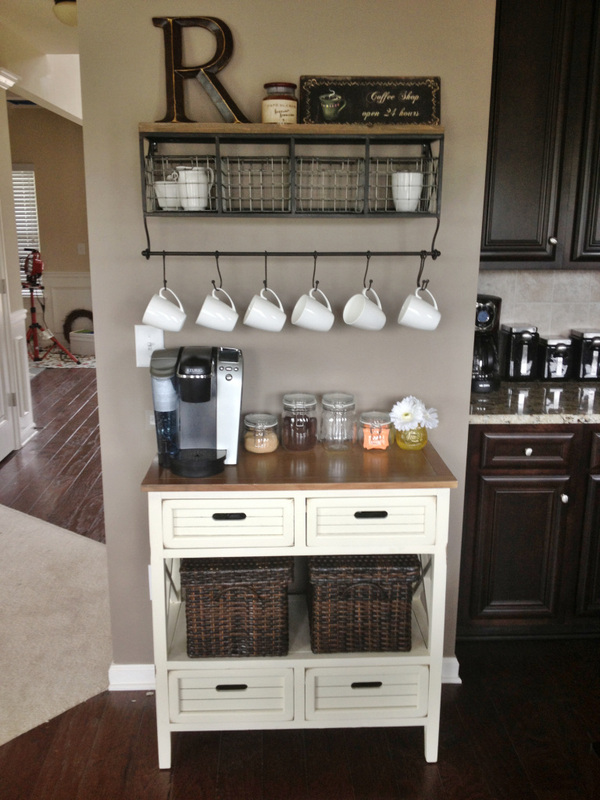 Speaking of coffee, I kind of want a coffee station. 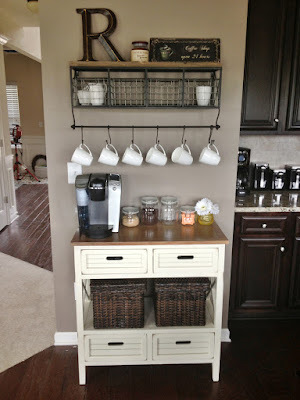 Yeah, I know, it is really strange for someone who doesn't like coffee, and someone who doesn't like having stuff on her kitchen counters, to want to have a coffee station (and a single-cup brewer), but you guys! That would just be so homey and cozy, and what a lovely thing for guests to be able to fix themselves a cup to ease their transition into the day. Well, I made it out of bed, without benefit of coffee or coffee station, and I am pleased to report that I am still out of bed. Yay, me. I'm still not too happy about the adult part, but I guess we can't have everything. I will tell you, I was really happy that my past-self, my last-night-self, was kind to her future-self and washed the dishes and cleaned the kitchen before she went to bed. The clean kitchen made a rough morning a little more palatable. Thank you, past-self. I appreciate you. I'm making taco bean soup today, so I thought I'd finally update y'all on how I make it now. 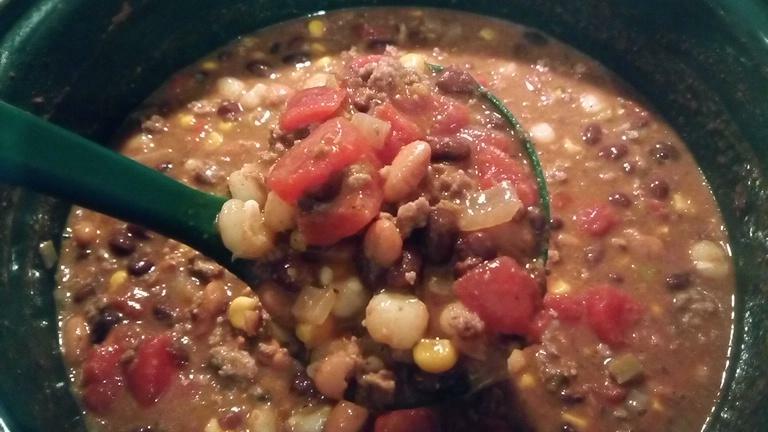 It all started years ago, when a dear friend gave me her recipe for taco bean soup. We were in a Bible study together, and the group decided to share our favorite soup recipes. At the time, Minestrone was my favorite, but I didn't make it often because it's a lot of work. Taco bean soup quickly became my new favorite soup, and continues to be my favorite because it is so tasty and, most importantly, easy. Through the years I've made modifications, so I thought I'd share the recipe as it stands now. I make this just about every week and freeze it in individual portions. I heat it up for lunch or supper or even sometimes, breakfast, if I don't feel like putting any effort into breakfast that day. Brown meat and add onion. Add remaining ingredients (do not drain vegetables--just open and dump). Simmer for 2 hours, stirring occasionally (I set my kitchen timer for 10 minute intervals so I don't forget). Optional: serve this soup with crushed tortilla chips (or you can make some baked tortilla strips) and shredded cheddar cheese. So yummy! Note: be sure to adjust the salt level based on your ingredients. I use no salt added beans and tomatoes, and my homemade seasoning mixes have less salt than their comercial counterparts. And I knew I had to watch the movie, but I wanted to read the book first. Hubby was out of town, and I stay up too late when he's gone anyway, but I stayed up until 2 in the morning reading the book, until I couldn't keep my eyes open any longer. Then I woke up the next morning and finished reading before I got out of bed. I spent the whole next day feeling groggy and out of sorts, but it was worth it. I had to keep reading, because I knew the secret. I just knew it, and I had to keep reading to find out if I was right (I was). That is absolutely the best kind of book. It's an amazing story of strength and courage, from where one would expect in a story of this sort, but also from a surprising direction that took my breath away. I devoured the book. I am so glad I read it: that I felt the things I felt and thought the things I thought. I'll carry it with me. But now, I don't know if I can see the movie. Because there is no way to do justice to this story in a movie, and I don't think I can bear to watch a movie that doesn't. So read this book. Or watch the movie. But probably not both. P.S. I probably will watch the movie, number 1 because I think Hubby will want to watch it, and number 2, for the same reason I had to keep reading--I need to know if I'm right. And if I'm not right, if the movie is amazing and gives all the feels and all the chills, I can't bear to miss that, either. Hey y'all. MC is done(ish. He had his last game and last practice, but for some reason they need to have equipment hand-in a week and a half after the last practice. I feel like that could have been easily accomplished the day after or even the day of the last practice), Bubby has one more week of football, and AKD has two of biking. It's been a long couple of super-busy months, and I am so looking forward to menu planning being difficult only because I don't know what to serve, instead of it being difficult because I don't know what to serve and I don't have time to prepare it and we have to eat in shifts. I can almost taste it y'all (and yes, I punned on purpose). 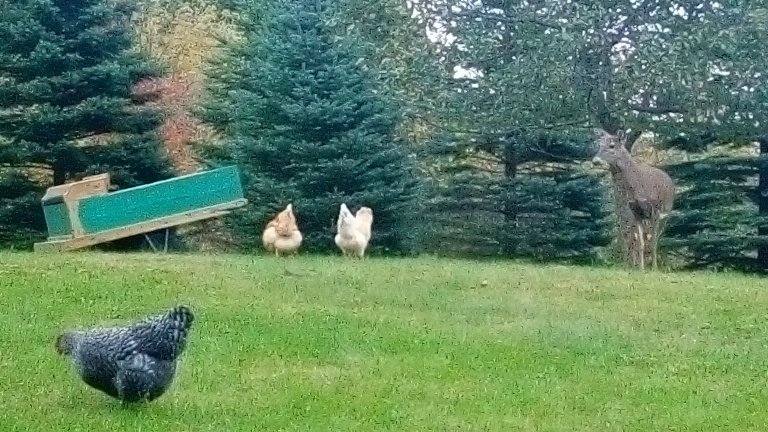 I don't have much to report on the chickens, but I know y'all wait anxiously for these updates, so... here ya go. Rocky and Toasty Crunch continue to lay approximately one egg each per day. Approximately, because every so often, they don't. 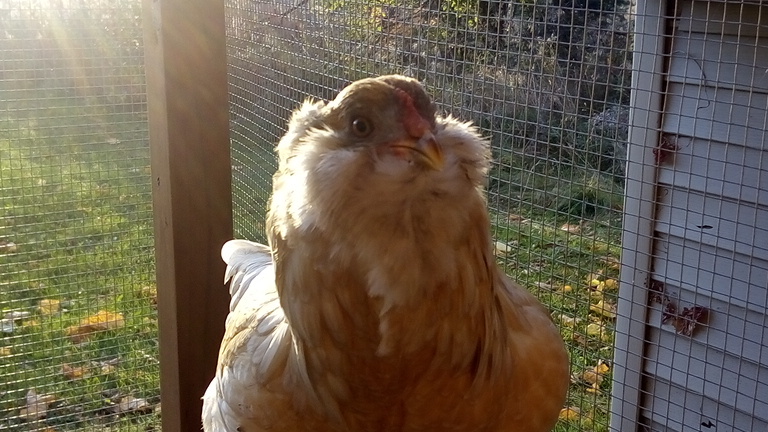 Esther is not laying yet. She's not doing the submissive squat, but her comb is pretty red. 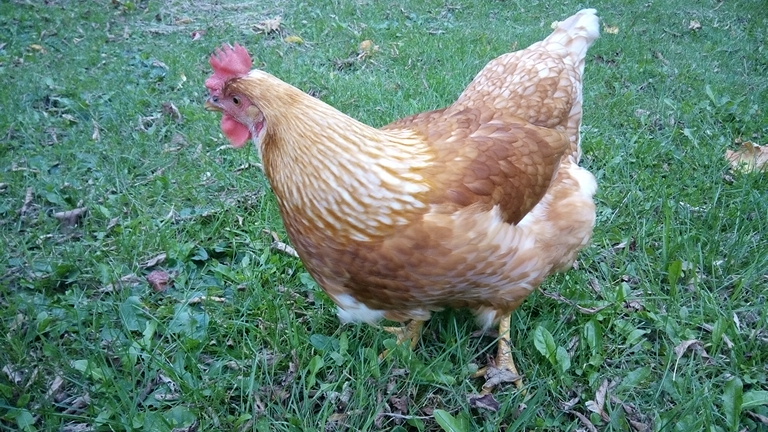 The thing is, Easter Eggers aren't a breed--they're mutts, and the hatchery mine came from uses different crosses to produce a variety of colors, patterns, and egg colors--so there really isn't a "typical" age for their Easter Eggers begin laying. I'm still waiting patiently. Sort of. Really looking forward to discovering what color her eggs are. 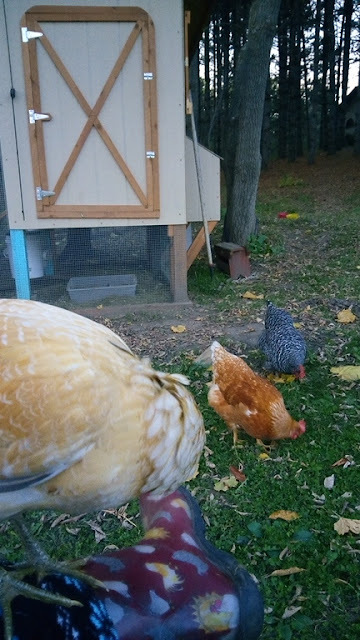 Rocky has taken to pecking Esther. For no apparent reason. Esther has taken to avoiding Rocky. For good reason. So I guess Rocky's at the top of the pecking order, and Esther is at the bottom, and Toasty stays out of it. Gallons of applesauce. It's so yum this year. Sweet and a little tart. our iron is for crafting purposes only. Kind of like the coffee filters. Anyway, I had to pick the apples. But before that, I brought the chickens some fermented food. Since I'm so efficient (not really, but go with me here), I approached the chicken coop carrying the ladder. True to form, the chickens freaked out. Toasty even went into the hen house until the other girls told her it was OK, it was just that crazy chicken lady who brings the food, and I had put the ladder down. I wasn't really expecting any eggs this early in the morning. As I explained, it takes more than 24 hours for an egg to develop, so the egg appears later each day, until the day there isn't one, and the next day, an egg will show up early in the morning again. So I wasn't expecting any eggs, but I checked the nest box anyway, and found another rubber egg under the roost. Does this mean Esther is laying and the first one surprised her? Or does this mean that Toasty Crunch was so freaked out by her human carrying a ladder, that she just had to let that egg go before it was ready? Let us hope it was the former, 'cause I can't handle never carrying a ladder or rake or shovel in the vicinity of the chicken coop. 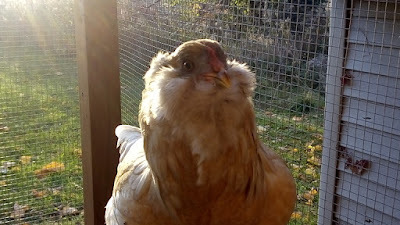 I'm kind of waiting patiently for Esther to begin laying, but I really would like to know what color her eggs will be. I'm using frozen crust for the pies, because they need to be in disposable pans, and why buy disposable pans and then put your own crust in, when for less than a dollar more, you can buy disposable pans pre-filled with crust (this reminds me of the egg carton thing)? As I went through the checkout lane with my turnips, potatoes, and pie crust, the cashier queried, "making pumpkin pie?" No. I am not making anything at this time. I am, however, buying pie crust, turnips, and potatoes, lady (oh, I guess that means I'm making a purchase). What's it to you? Why? Why would you go there first? Pumpkin? Apples are in season, too. If anything, she should have been wondering if I was making turnip or potato pie. Of course, based on the number of apples I was able to get (possibly not enough), I might be making pumpkin pie, too. But that is most definitely beside the point. Maybe. The answer is maybe, lady, ok? And yes, friends, I know the cashier was just making conversation. Whatever. I'm using my friend's apple pie recipe. I asked her for it last year, when she mentioned making pies (using free apples and store-bought pie crust) and selling them. She texted me a picture of a recipe card: "Grandma Opal's Apple Pie," it said. Oh, how sweet, I thought. KT's making apple pie from the recipe handed down from her grandma. I wish I had my grandma's apple pie recipe. Well, actually, maybe I don't. I don't remember my grandma ever making a pie. But no. In the next text message, KT shattered my fantasy, "truth be told, I don't have a Grandma Opal. It was the recipe on allrecipes.com that had the most reviews." Alrighty then. At least now I don't have to feel bad about not having my Grandma's pie recipe. And actually, the recipe card KT sent me bears only a passing resemblance to the recipe posted on allrecipes. Apparently, step 2 in the apple pie making process is blogging about it. Blogging is, after all, one of my favorite chore avoidance techniques. Not that making apple pie is a chore, but peeling, coring, and chopping apples for the pie is. I'm trying to decide if I think it's worthwhile to get out our peeler/corer/slicer for 12 apples. And, you know, writing about it helps. Or at least delays the decision. 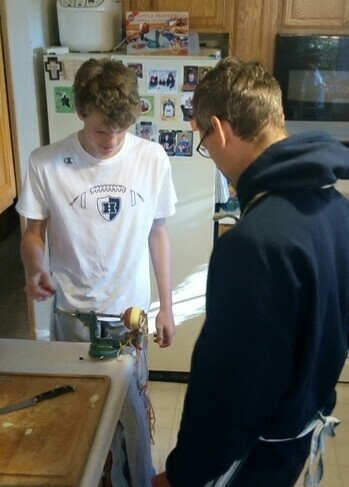 The boys, peeling, coring, and slicing apples. But, I think I need to get going, because my feet are cold. And it's not like I can close the window or put socks or slippers on. I need to get away from the open window so my feet will not be cold. Step 3: make the pies. Just Grandma Opal and me. In the kitchen. Here I go. Y'all, this is seriously the longest September ever. Know why? Even though I spent half of August thinking it was September, and since September has 30 days, I should think it's halfway into October already, I still think it's September. As I was typing that title up there, I was kind of squinting at the September section of my little year at a glance calendar, thinking, ok, what's the date? September 11? Yeah. That sounds about right. So weird, y'all. You would think I really like September or something. I mean, it's alright, but not 8 weeks-worth! 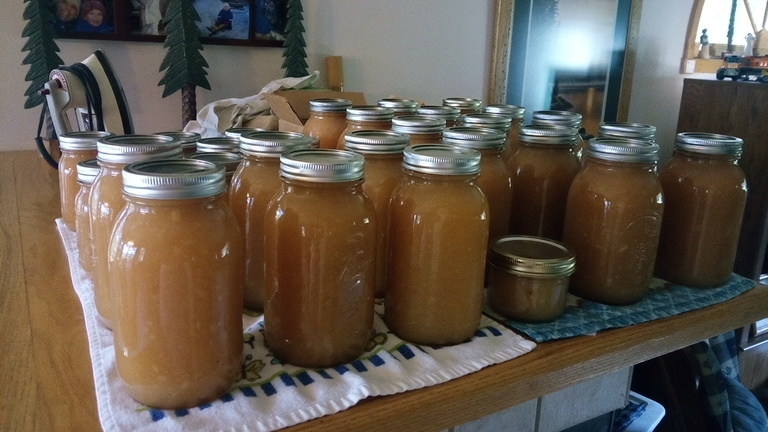 We canned applesauce this weekend. I'm so glad. We were running out, and the apples were ripe, and we've got stuff going on every weekend for the rest of September October (see? I did it again), and making applesauce is not really something I want to do on my own. So yay. 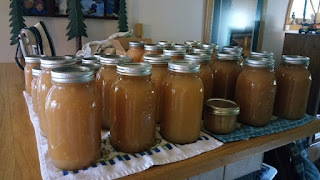 We had a smaller than usual harvest this year, so we only made 6.25 gallons. Yeah, I know. Only. Speaking of only, we only have two more weeks of crazy, crazy, crazy busy. Only two more weeks of needing to leave the house to pick up a kid every day right at supper-making time--MC's football season is almost over. Then it'll just be crazy, crazy busy. Cookies of some sort. Maybe snickerdoodles.